Lark Books (NC), 9781454709367, 144pp. Self-striping yarn is increasingly popular with crafters, but many knitters lack the knowledge to work with the yarn effectively. 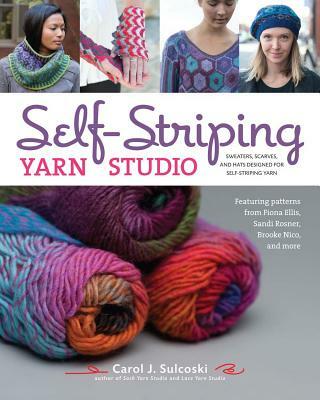 Carol Sulcoski's latest book begins with a comprehensive technical section that explains how to use and manipulate self-striping yarn--something no previous pattern collection has offered. After reading the accessible instructions and tips, knitters will be inspired to cast on one of 24 new and original designs--11 beginner, 11 intermediate, and two advanced--including shawls, scarves, sweaters, fingerless mittens, and more. Featured designers include Fiona Ellis, Brooke Nico, Sandi Rosner, Cornelia Tuttle Hamilton and more. Part of Lark's "Yarn Studio" series, which includes Sock Yarn Studio and Lace Yarn Studio. Carol J. Sulcoski is a knitwear designer, writer, hand dyer, and teacher. Her books include Sock Yarn Studio (Lark), Lace Yarn Studio (Lark), Knit So Fine (Interweave), and Knitting Socks with Handpainted Yarns (Interweave). Carol's work has also appeared in such magazines as Vogue Knitting, KnitSimple, Interweave Knits, KnitScene, and Noro Magazine. Carol's hand-dyed yarns can be purchased at blackbunnyfibers.com. She lives in Villanova, PA.